Shelters can be reserved in Glazebrook Park and Homer Adams Park. 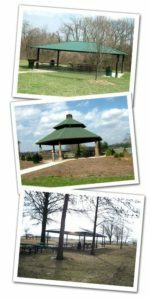 Homer Adams Park has three rentable shelters; Glazebrook Park has two rentable shelters and a gazebo. To reserve a shelter, a call needs to be made to the Parks and Recreation Department to first make sure the date is available. If the date is available, your reservation will be penciled in until payment is received. You may either print off a registration form from the link below and send it into the office with your payment, or you can drop off your payment at the office during regular working hours. Payment must be received within one week of calling the office to secure the reservation. Glazebrook Park Shelter #1 is the shelter closest to the playground. Shelter #1 measures 24′ by 34′ and includes six picnic tables measuring 8′ each. Shelter #1 comes with access to both water and electric. Glazebrook Park Shelter #2 is the shelter further from the playground. Shelter #2 is identical to Shelter #1, measuring 24′ by 34′ and includes six picnic tables measuring 8′ each. Shelter #2 comes with access to both water and electric. Whispering Winds Gazebo at Glazebrook Park is a beautiful setting for a family reunion or a wedding. The gazebo measures 35′ in diameter, includes 6 picnic tables measuring 8′ each and has access to both water and electric. Shelter #1 at Homer Adams Park is the shelter to the west of the playground. Shelter #1 has a 16′ diameter and has 4 picnic tables measuring 8′ each. Both water and electricity are available. Shelter #2 at Homer Adams Park is the shelter to the east of the playground. Shelter #2 has a 16′ diameter and has 4 picnic tables measuring 8′ each. Both water and electricity are available. Shelter #3 at Homer Adams Park is the large shelter just west of the main parking lot. Shelter #3 measures 24′ x 44′ and has 8 picnic tables measuring 8′ each. The cancellation of a shelter reservation is fully refundable up to two weeks before the the reservation. Any cancellation within the two week time period will not be refunded.